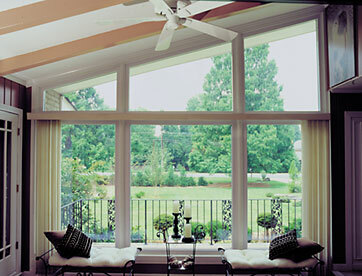 VARCO offers a wide variety of picture windows and specialty-shaped vinyl replacement windows. Our picture windows and specialty-shaped windows look unique as a stand-alone window. Or, they can be combined with other window styles in multi-window configurations to add a decorative accent or to enhance your home's architecture. Select from full-circle windows, quarter arch windows, and parallelogram-shaped windows, just to name a few. VARCO Picture/Architectural Windows are available in a wide variety of painted exterior colors. Solid Vinyl, Multi-Chambered Construction will not chip, peel or rot; never requires scraping or painting. Fully-Welded Frame provides added strength and enhanced thermal performance. Direct Set, Exterior Glazed 13/16" Insulating Glass Unit.